A wood shaper is one of the best tools you can have in your workshop thanks to a great deal of functionality they provide. One of the jobs you can use a wood shaper for is for spindle repairs that you intend to make on any existing ones or creating new spindles. Most shapers are tough and durable as they are made of galvanized steel. One of the best wood shapers is SHOP FOX W1702. This shaper has a strong ball bearing that allows it to have a good range of motions. When you are looking for a wood shaper, durability and functionality should be your top priority, and this shaper excels in both. When using this wood shaper, make sure to have a shaper table for support so that the tool is tight and secure while you are using it. The less likelihood of slippage there is, the more confident you will be that you are safe. SHOP FOX W1702 is a great tool to have in your workshop as you master complex and difficult woodworking projects. What makes this wood shaper stand out from the rest of the market? The SHOP FOX W1702 features an extensive precision-ground cast iron table as well as removable table inserts that offer work support near the cutter. 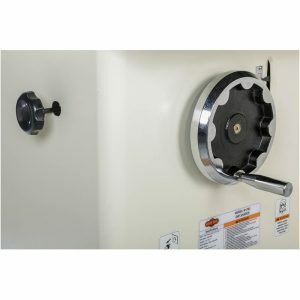 This machine is also equipped with a three-inch dust port that you can connect to a dust collection system to keep your workshop clean as well as heavy-duty miter gauge. The machine comes with 3 spindles; 1-inch, ¾ inch, and 1/2-inch. It also includes 3-inch of spindle travel and a max spindle opening of 5-1/2 inches. You can easily interchange the spindles which help saves your valuable time. This wood shaper comes with a safety guard to shield you from flying debris and dust while shaping. The guard can be removed for pattern shaping in the absence of the fence or when you need greater access. You will also get safety hold-down bars which attach to the mounting brackets built in the fence. With SHOP FOX W170, you will get a wood-split fence and a heavy-cast iron that can be adjusted easily. You can adjust the two fence faces independently to allow for multiple shaping tasks. You can set the fence at offset positions to remove material from the same position for shaping portion of the entire edge of a piece of wood stock. This coating finish is to help resist scratches, fading, and chipping. It also prevents other wear. 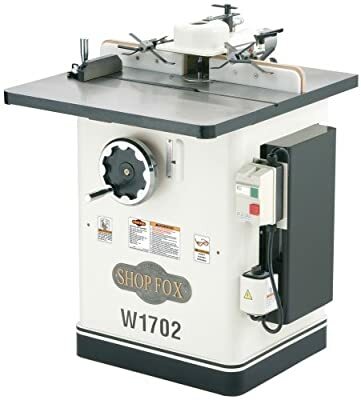 SHOP FOX W1702 wood shaper features a three HP, 220V sole-phase motor with a reverse/forward spindle control. Also included are a fence with safety guard, heavy-duty miter gauge, all-ball bearing construction as well as large precision cast iron table. They operate at either 10,000 or 7,000 RPM depending on the pulley ratio. 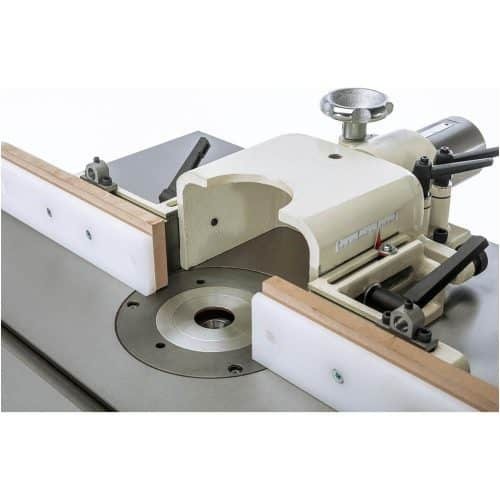 This full capacity 3HP shaper can handle even the tiniest profile cutters all the way up to the large panel cutters of up to 5-1/2 inch max spindle opening as well as 3-inch of spindle travel. There are two reversible speeds which provide great flexibility for arranging cutters of various sizes. Irrespective of what the shaping application is, whether it is making door stiles, panels, and rails or simple profiling, this is the ideal machine for the job. The SHOP FOX W1702 shaper is a specialty woodworking machine that is ideal for profiling the edges of various types of wood. Generally speaking, it is a tool for any professional woodworking person that is looking to take their woodworking projects to another level. It is a budget shaper for any home woodworker who likes DIY woodworking projects. This shaper is great for profiling edges, and with this, I mean things along the line of cutting beading and rabbets, as well as grove and tongue joining of boards. However, the most important use of this shaper is for making raised panel doors. This shaper tapers and thins the door panels, and also profile door stiles and rails for panels to set into. It is a great tool to have in your workshop, and we would recommend it to any DIY or commercial woodworker. Should I Invest In A Wood Shaper?